Rosemont Public Safety received several calls from guests at the hotel stating there was a noxious odor spreading across the 9th floor about 12:45 a.m. Sunday. Crews discovered a high level of chlorine gas in the air and evacuated hotel staff, guests and pets. HazMat technicians decontaminated the area and conducted tests. Paramedics took 19 guests who complained of nausea and dizziness to hospital. As we wake up today we want to continue to provide the best possible convention that we can, despite the trying circumstances. The convention will be running on a full normal programming schedule today. 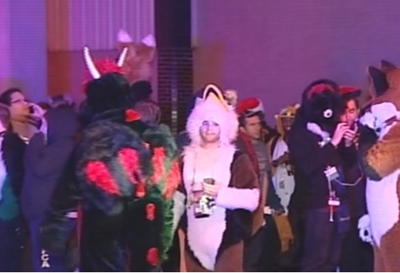 We ask you to continue to be patient, and remember that the volunteers who make Midwest FurFest happen intend to give 110% to make sure that the fun, friendship, and good times of Midwest FurFest 2014 overshadow last night’s unfortunate incident. To dispel rumors: Because this was an unforeseen possibly criminal act, Midwest FurFest will not be offering refunds, nor will the Hyatt Regency O’Hare be comping any rooms. Any further questions should be referred to info@furfest.org.